Commercial King and Opilio crab fishing is one of the most dangerous jobs in the world. For decades, our award-winning maritime injury lawyers have fought hard for injured crab fishermen. Working in the Bering Sea and the Gulf of Alaska, crab fishermen labor long hours in bad weather conditions and rough seas. The Bering Sea, Aleutian Islands, and Gulf of Alaska together produce approximately one-third or more of total U.S. crab catches on average. Ten species of crabs are caught in Alaskan crab fisheries, and seven of these have commercial importance: red king crab, blue king crab, golden king crab, Tanner crab, snow crab, hair crab, and Dungeness crab. Vessels can be covered in ice, it may be snowing, decks are slippery, and crab pots may be stacked by the hundreds out on deck. In Washington and Oregon, the commercial Dungeness crab fishery is equally, if not more, dangerous. It harvests millions of dollars of crab every year off the coasts of Washington, Oregon, and in Puget Sound, including significant ports in Ilwaco, Chinook, Westport, Tokeland, La Push, Astoria, Newport, Brookings, Coos Bay, and Port Orford. If you or a family member have sustained an injury while crab fishing, contact us today for confidential legal advice on your right to compensation following an injury. 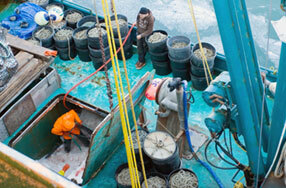 Commercial crab fishermen are not covered by state workers’ compensation laws. Instead, they must look to the federal Jones Act for compensation following a serious injury at sea. Under the Jones Act, an injured crab fisherman may collect damages for lost wages, lost earning capacity, cost of retraining, disability, loss of enjoyment of life, and disfigurement caused by the negligence of their employer, a co-worker, or other unsafe condition. Each claim is different. Only by consulting with an experienced maritime injury lawyer will you be able to determine the value of your claim. If you have questions about the types of compensation you can collect as an injured crab fisherman, contact one of our experienced maritime injury lawyers for a free consultation. We can meet with you at our offices in Seattle, your home, or by telephone. Call 206.624.8844 for your free consultation. Case Example: Our law firm represented a crab fisherman who sustained serious injuries to his leg and foot while attempting to repair a crab sorting table on a crab fishing vessel in Alaska. While attempting to repair the heavy crab sorting table, a hydraulic leak caused the table to collapse on our client and he was seriously injured. We were able to prove that the sorting table was unseaworthy and that his employer was negligent, obtaining a significant settlement for our client. Like the tough crab fishermen that work on these boats, the lawyers that represent them must have the skill, knowledge, and resources necessary to go the distance against insurance companies and vessel owners following a serious injury. The legal issues presented by crab fishing cases may be complex and involve equipment that is specific to the crab fishing industry. Most land-based personal injury lawyers are unfamiliar with the Jones Act. Because we routinely handle crab fishing injury cases, our award-wining lawyers are prepared to confront these challenges and obtain maximum recovery for injured fishermen and their families. We offer a free consultation with an experienced maritime injury lawyer in our office, in your home, or on the telephone. Call us today for your free consultation at 206.624.8844.